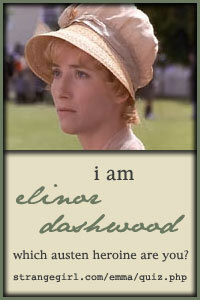 You Are...Elinor Dashwood of Sense & Sensibility! You are practical, circumspect, and discreet. Though you are tremendously sensible and allow your head to rule, you have a deep, emotional side that few people often see. Yeah, I can see this (yes, I do realize it's just a silly Internet quiz that means nothing). There was a time when I would have been horrified by such an estimation -- I'd rather be Elizabeth Bennett, Emma Woodhouse, or even Marian Dashwood; someone more passionate, full of life, vibrant. But upon deeper thought, no, I don't think I would like that (though I would love to have my own personal Mr. Knightly!). Marian is unrealistically romantic, Emma a little too impulsive, and Elizabeth a bit too prideful. If I had to pick an Austen hero that most reflects me, Elinor does come closest. I'm not all head, but I do often lead with my sensible side rather than with my passionate side. I have realized this with clarity the last few weeks, as I watched a friend make choices with her heart that I worry are unwise; choices I would never touch with a ten-foot pole. Their wisdom will eventually reveal itself, and even if they are unwise, she will be fine and life will go on. But as I watched events unfold I saw all too clearly my strong leaning to be sensible, prudent, cautious. Yet there are times when my passions and emotions rule. Usually they come spilling out of me, or exploding out as the case may be, in giant waves that overtake me and leave me breathless. Probably because I don't let them come out and play often enough -- though I am learning to change that, to feel my feelings as they come, even if I still do not let them lead me. Perhaps that's why I see some truth in this silly little quiz. Because I think I am like Elinor. It's amazing how her sensible side protected her from so many things, including love, sadly; until she allowed herself to admit she felt it, and needed it. And she, too, eventually learned to let her feelings out, to feel them and acknowledge them even as she still refused to let them lead her choice. Truth can be found in the oddest places. Oh dear... I came out as Anne, from 'Persuasion'... whom I barely remember. And I so wanted to be Catherine Moreland; Northanger Abbey is not 'great fiction' but it's a lot of fun. Alas. My roommate, without taking the quiz, informs me that she is Fanny Price. And you remember Nancy F.? She's a born 'Emma'! The quiz questions were a hoot - quite fun. Makes me want to go play the pianoforte or something. Deb and I watched a made-for-TV Austen-esque movie last night - 'The Inheritance,' based on Louisa May Alcott's early, long-misplaced book of the same title. We got it from Netflix. Sometime when you're in the mood for something girly and slightly stupid, with horses and nice dresses, you might look for it. I don-t rightly remember her...but the description is disturbingly close to accurate! You find such fun quizzes!